This is for Tiffany’s (DTGD13tiffguam) Dare to Get Dirty Challenge! You’ll need to be a Splitcoast Fan Club Member to view the challenge so check it out! For my card, I used a quote and some butterflies from DRS Designs. I white embossed the greeting on a lt blue Spellbinders oval cut shape and rubbed some darker blue ink inside the die edge to make it stand out a bit more. The butterflies were also white embossed on blue and carefully more blue was added with Copic markers. I emphasize carefully because the Copic markers can dissolve heated embossing powder. Just ask me how I know, lol. The largest butterfly was actually created from a butterfly profile image…the left side is the normal image. I stamped it again on the plastic sheet from my SAMJ (stamp-a-ma-jig) then pressed it against the card stock and embossed for a mirror image of the other half, then put them together. The vellum was embossed w/ an embossing folder and I put a strip of the same lt blue behind for a little extra interest. The finished card is 4.25 x 5.50. Thanks so much for stopping by! You still have a few days to enter the DRS Thursday Challenge. This week….CHARMS…use a charm on your project and link it up to the challenge. DRS images are not required. 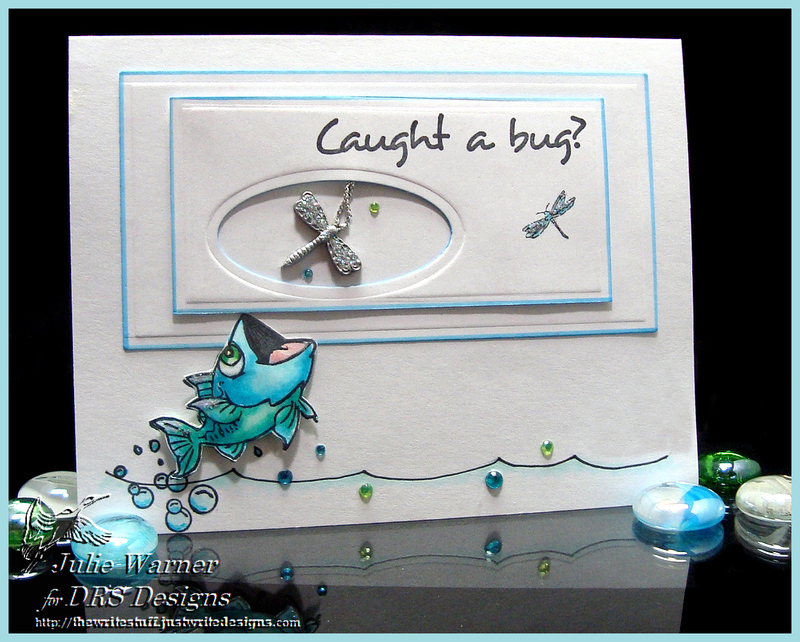 Another fun challenge for Splitcoast Stampers Dare to Get Dirty week! This is for my friend Bev’s (DTGD13TexasGrammy) challenge. You’ll need to be a Fan Club Member to view the challenges, so check it out! For my card, I had a polished stone background I made forever ago and the colors really said “southwest” to me. So I left the background as is and black embossed the pottery on another section of the same background. I used a white gel pen to add a few accents and then fussy cut them. The turquoise square was die cut then I used a small border punch around the edges and also on the narrow turquoise strip. The dusty durango piece was embossed multiple times using a border folder. I thought it needed a little something so I used my Copics to color three white brads. Instead of doing them in a solid color, I used the tip of the markers to add a little swirl pattern. The finished card is 5.50 x 4.25.